Mock-up of the 6-10 story building at 1979 Mission St., as see from the corner of 16th and Mission. San Francisco Planning Commission on Thursday afternoon will hold one of the neighborhood’s most anticipated hearings this year — a showdown between neighborhood activists and the developer of a proposed 331-unit housing development at 16th and Mission. “I hope to make it out alive,” said Planning Commissioner Dennis Richards, who has seen his share of raucous meetings. Indeed, this meeting — scheduled for 4 p.m. at Mission High School, where the auditorium holds not quite 2,000 people — promises to be loud, crowded, and long (the Planning Commission limited the hearing to four hours). And it’s unclear what, exactly, will be accomplished. It was ostensibly called so that Maximus Real Estate Partners, the project’s developer, can present its new community benefits package to the commission and community members, and for community members to say what they think about it. But for years, Maximus and members of the Plaza 16 Coalition, the project’s organized opposition, have been unwilling to budge on their wildly different visions for the site. Maximus, despite one informal community benefits concession after another, continues to push for a mostly market-rate project. Meanwhile, members of the Plaza 16 Coalition have steadily called for a 100-percent affordable development. “We are very much looking forward to finally setting the record straight as to why the Monster is not the right project for the site, the neighborhood and the city,” said Chirag Bhakta of the Plaza 16 Coalition. The coalition, he said, would be presenting its own proposal for the site — a 100-percent affordable project with ground-floor social services. “The Marvel in the Mission is the final product of a nine-month community process,” he said. By contrast, late last month Maximus presented a portion of its “best and final” community benefits offer to District 9 Supervisor Hillary Ronen. 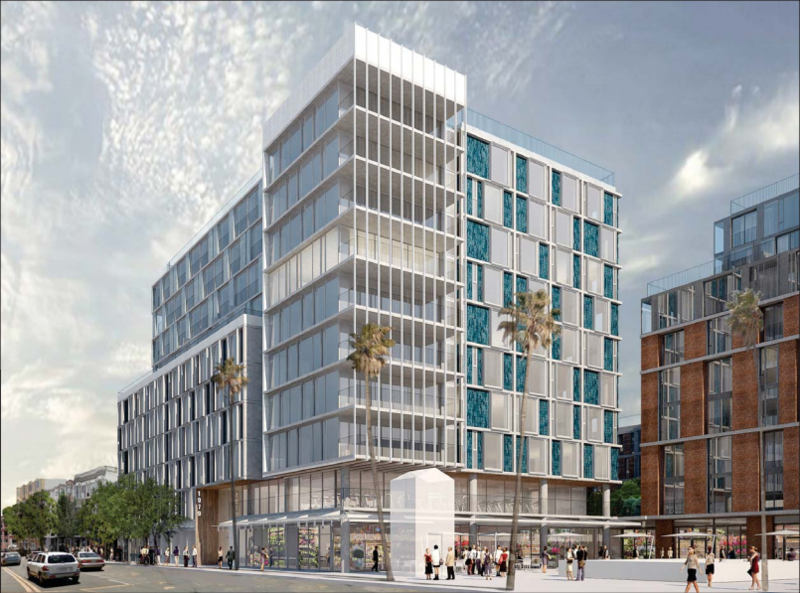 The developer would grant two fully entitled sites elsewhere in the Mission to the city and would contribute an unspecified amount of money to build affordable housing on those sites. “It remains unclear what the proposal is,” Ronen told Mission Local, noting that Maximus has not formally submitted any paperwork to the city. Ronen said that if Maximus committed to building 192 affordable units elsewhere in the Mission, she would consider it. At this point, she said, she struggles to see how feasible that would be. For starters, Maximus does not yet own the sites: One is a fully entitled 117-unit site at 2675 Folsom St. and another is entitled for 75 units at 2918 Mission St. (currently the site of a laundromat). Maximus would first have to buy both entitled sites — presumably for dozens of millions of dollars — and then actually build the affordable housing. That could cost about $115 million more, considering the average affordable housing unit requires $600,000 to erect. He has set no asking price. “Its worth will be determined by the market,” he said. Maximus representatives said it would take the issue to voters, and sponsor a ballot initiative if its proposal is rejected. If Maximus had simply just made this a State Density Bonus project, they’d have their project built by now and a lot of people would be home by now. Alas, live and learn — and the Carnival continues. Developers don’t care about community’s they care about profits. San Francisco needs affordable housing for the people who live and work here. Every project should be 80% affordable housing. The land the PUC is selling at City College should not be market rate housing it should be 100% affordable housing for people who have been displaced by high rent increases and evictions. Alex, 80% affordable? do you understand math? you want 20% of the tenants to support the other 80%. Which would mean essentially, 20% of the people would need to pay 2-4 times market rate. Uh…. you must be in your pj’s cause you dreamin’. Right, and we should all be subsidized for everything else that we consume. That way I don’t need to incentive myself to show up to work everyday. It’s a nice fantasy, but it’s extremely difficult to create a tiny bubble of socialism inside a larger capitalist market. In fact, it’s impossible. plaza 16 are the same folks that have wanted to preserve a laundromat instead of housing. unfortunately the activists live in an alternative reality and do more harm than any good to the rest of the Mission. Build it. These “activists” do not represent the entire community. My wife and I live here and we want more housing. The would give market rate and affordable housing.